A guide to the Classes & Orders of insects and other arthropods. The Insecta (insects) are a Class of the large animal Phylum called ARTHROPODA (arthropods) – a name that refers to the jointed limbs. The other major Classes of living arthropods (i.e. animals related to insects) include the Crustacea (crabs, lobsters, shrimps, barnacles, woodlice, etc. ), the Myriapoda (millipedes, centipedes, etc.) and the Arachnida (scorpions, king crabs, spiders, mites, ticks, etc.). In addition there are several minor Classes, the Onychophora (velvet worms), Tardigrada (water bears), Pentastomida (tongue worms) and Pycnogonida (sea spiders), all of which contain somewhat aberrant living forms of uncertain affinities to the any of the preceding groups, and finally a Class of extinct arthropods, the Trilobita (trilobites), known only from their fossil remains. All these animals are characterised by a tough outer body-shell or exoskeleton, with flexible joints between the skeletal plates to allow the animal to move. The main external body features which distinguish each of the four major Classes of living arthropods, Crustacea, Myriapoda, Arachnida and Insecta, are shown below (with those that separate the insects from all other groups highlighted in red). Excluding one or two very small groups of shrimps, the crustaceans are split into 9 main Orders, as listed below. They nearly all live in water and range from minute planktonic shrimp-like creatures, such as water fleas, to the large, more familiar, crabs and lobsters. Some members of the Isopoda are the only forms that have really invaded the land and most of these are largely confined to damp places. Follow the available links for further details. There are four groups of centipede-like creatures known collectively as myriapods. These are listed here as Orders of the Class Myriapoda, but in many arthropod classifications, they are given the status of separate Classes. The arachnids are usually split into 8 main Orders, as listed below. Follow the available links to see examples of some of these groups. 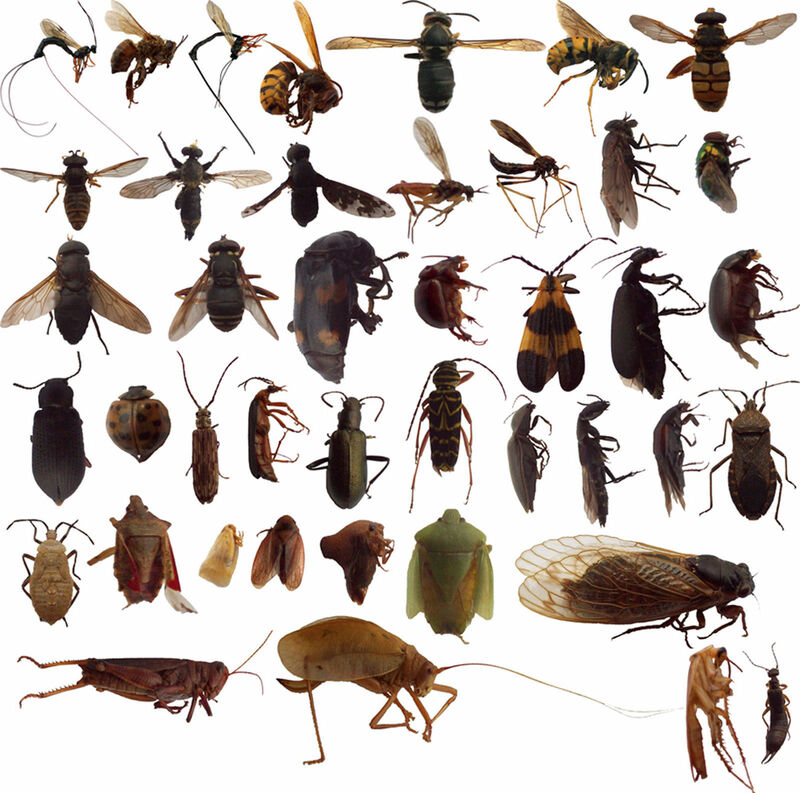 The insects are generally sub-divided into 29 Orders. These are listed below with links to pages describing general characteristics, recognition features and examples of each Order. You can also follow the link at the bottom of this page for a simply identification key to most of these Orders. These are wingless insects and their body structure suggests that they have never had wings during their evolutionary history. Young stages resemble the adults – little or no metamorphosis. These are winged insects, although some have lost their wings during the course of evolution. When present, the wings develop externally and there is no marked change (metamorphosis) during the life cycle. The young stages, called nymphs, resemble the adults except in size and in lacking fully-developed wings – simply metamorphosis. These are winged insects, although some have lost their wings during the course of evolution. When present, the wings develop internally (i.e. inside the body of the immature insect) and there is a marked change (metamorphosis) during the life cycle. The young stages are very different from the adults and are called larvae. The change from larva to adult takes place during a non-feeding stage called the pupa (or chrysalis) – complex metamorphosis.